MAKE YOUR DIGITAL SIGNS INTERACTIVE! 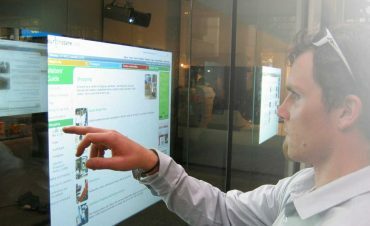 Interactive digital signage is commonly used in wayfinding applications, where touch-screens let visitors navigate an interactive map. You will often find interactive display software deployed in retail stores, transportation hubs, corporate offices, stadiums, exhibition halls, and public spaces. Hotels also use interactive digital signage screens for concierge applications and information kiosks. Why consider QL for Interactive Digital Signage? Navori QL lets customers create and manage any type of interactive scenario via a wide range of technologies, like touch screens, RFID, Kinect motion sensors and even panic buttons. It really doesn’t take a lot of effort to enhance any display and turn it into an interactive kiosk. If you don’t already own touch-enabled screens, you can add interactive surface films or motion sensors and achieve excellent results. The fact is, your screen can still be used to deliver advertising content and information, even after you’ve applied an interactive surface film. Start by creating some interactive content in Flash, HTML, HTML5, or use a common programming language that is compatible with your media player’s operating system. Part of a scheduled playlist so your audience can interact with it when it shows up on screen. Triggered using the QL Player Trigger API. QL Trigger will launch your selected content or playlist whenever an event occurs. Events can be anything, from a key stroke, touch of the screen, remote control device, sensor, RFID, evacuation alarm system, fire alarm, etc. Third party interactive applications can be triggered based on user detection using a keyboard or touch screen. The QL Player trigger API is available for Windows and Android operating systems. Since Navori QL supports interactivity either from a keyboard and mouse or touch-screen, users can easily adapt their own interactive Flash or HTML applications and leverage the software’s content management and scheduling capabilities. By adding the Navori QL Spy module, users can further enhance their applications. QL Spy will remove QL Player from the screen when interactivity is detected. You can trigger any Flash, HTML5 or third party application so the viewer can interact with the screen. After a predefined period of inactivity, Navori QL Player is returned at the forefront, displaying the scheduled content like nothing happened. Key benefits: No programming necessary with interactive digital signage. Easy to configure and update. Supports a wide range of third party software applications. Invite potential users to interact with available content. Make accessible a multitude of interactive information. Involve users by providing dedicated control of interactivity content. Provide access to visitors to help finding what they are looking for.